In the recent Wolf Hall adaptation Henry was seen dining at the head of the table. The image of the monarch at the head of a long table seems to be a popular image. However, as far as I can tell, from the Middle Ages right up to the present day (at least in England and later Britain) the monarch has always dined either at a separate table or about halfway down the long side of a rectangular one, in the midst of their fellow diners. Is there evidence of a sovereign sitting at the head of the table, and if not, where did this image come from? No one has come up with an idea - so what about all the Round table notions? if a round table was thought necessary for equality then there must have been the notion of the head if the table. or am I being dizzy again? I was born blonde. The whole 'Round Table = equality' concept is a bit daft, when you think about it. It seniority reflects who sits closest to the King, it doesn't really matter what shape the table is. But if all the knights are equal it doesn't matter where they sit! Some people are born blonde, some achieve blondness, and some have blondness forced upon them. The novels I read about the aristocracy and higher middle classes (I am not very clear on the British class system in all its guises - that might be the wrong term) seem to have clearly delineated places for where people to sit, and I have been under the impression the head of the household sits at one end and his wife at the other. But that might not be the case for the monarch/might not be the case in reality for anyone at all. But I suppose for the purposes of drama, even if it was/is not the case, putting the monarch at the head of the table gives him/her the obvious status the directors want to show and puts him/her clearly apart from the rest of the table. I suspect that this is based on contemporary practice - a High Table, with the most important person in the centre, and the man at the head of the table and woman at the foot comes later - and probably further down the social strata, hence the name "carver" for an armed dining chair. Long table dining probably had benches. Try getting to your place in long robes..... and if a family had few chairs then they would be pt at the ends - and the best one for the King - so perhaps they got it right. I have no idea when individual chairs were used at a table - probably stools were used first. And would the women hae dined with the king or would they have been fluttering about the place getting dishes moved? Our (My) vision has been influenced by too many films I fear and directors assumptions. Whenever I held meetings I always sat midway - the ends were for minutes secs - and any guests called to them. I know meetings usually show the leader at the end but I would have found that more difficult for the argy bargy bits of business and keeping the temperature down. Just a question comes to mind - where would the Cellini salt sellars be placed for the lesser folk to sit below? The Queen sits with the Cabinet for the first time - 2012. I think the Prime Minister always sits in Cabinet as shown - in the middle - as in the Last Supper? Have tried without success to find paintings of earlier Cabinet meetings, but here is one of the Privy Council in 1604. No sign of James I anywhere at the table, but I think the space at the top was left free for him in case he decided to show up. I'm sure that's where Elizabeth I sat at meetings - and she usually did show up. But the OP is more concerned with dining tables, not council tables. Here's a medieval scene - presumably the chap seated centre (with the ermine stole) is the king. Looks a bit like Richard II. I think there might be a difference between whether the King was feasting in state, dining with just a few nobles, or eating in his privy appartments, but generally whenever the king was in public he was there to be seen and for everyone to recognise his rank, and know their own place. So when dining in state (and even on ordinary days the king probably dined with a hundred or so courtiers as the court typically numbered about 1000 people, and they all had to be fed), I believe it would have been a bit like a traditional wedding banquet ... or probably often even more like school dinner given the numbers to be catered for! So as I understand it, the king was sat in the middle of the top table, the most highly ranked guest on his right hand, and going outwards on either side other highly ranked nobles and guests, all strictly placed in order of precedence and all sitting along one side of the table only and facing out into the hall. The lower ranks would then be along side tables, all again in strict order of precedence. Again this arrangement means that everyone can see the King in his majesty and also clearly knows how far down the ranking they are. Seating on these lesser tables may well have been on both sides, particularly as for these lower ranks food was generally severed in messes, that is a platter to be shared amongst four (and hence also all the injunctions against dipping your bread in the shared pot). If dining with just the privy council or with a select group of nobles/guests I'm sure the same general rules would still apply just on a smaller scale, so again the king would be sat in the middle of the table. Your picture Temp is late 14th century - it's the King of Portugal dining with John of Gaunt and a select group of lords spiritual in 1386. I note that only the honoured guest, John of Gaunt (at left) has a chair, the King (in the middle) is on an upholstered divan, while the two lower ranked bishops at the front share a simple wooden bench. Going forward to the late Tudor period the same seems to apply. 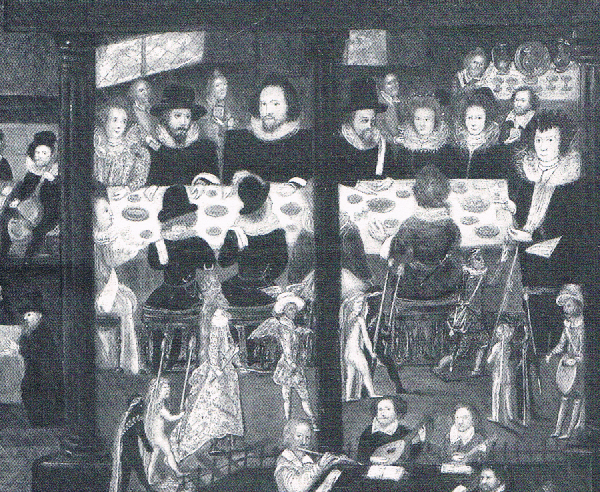 This is from about 1595 and shows Sir Henry Upton dining with just his family and a few friends so they are all sitting around a single rectangular table. But Sir Henry still sits in pole position in the middle of the table with his honoured guests on either side and directly opposite. His wife is at the end, at what one might now call the head of the table, but clearly then was a secondary position. The figures parading past in the foreground are probably the children and younger servants providing entertainment in the form of a masquerade (and this wouldn't have been performed while everyone was actually eating). This picture also nicely shows the diners with their table napkins folded over their left shoulders or left wrists, which is correct Tudor etiquette. Finally here's a more intimate royal meal - a young Henry VIII dining with just four guests (all four seemingly being played by Mark Rylance) on the occasion of an investiture of the Order of the Garter (although I assume there would also have been a much grander banquet as well to celebrate this occasion). Henry is sort of at the head of the table but then there are only four guests - the chap standing at the front is ceremonially carving the roast. Note also that although these are all nobles they are still effectively dining as a mess and sharing food from a central platter. There you go P, the Duc de Berry at dinner, with a massive showy gold nef for the salt carefully placed directly in front of him .... everyone else, even the honoured guest, was below the salt as far as he was concerned. PS I like the little dogs on the table ... I assume they're not the next course! I also see that this pic shows the top table to be raised on a carpeted dais just to make sure the duc is sitting higher and more visible than everyone else on the lower tables (and so literally lower in height too). And I note yet again that all the servers, butlers, wine pourers and carvers attendant at the top table are exclusively male and seemingly of high birth ... common servants, probably also nearly always male, were only for doling out the bread and pottage to the lower tables, and the actual cooks, be they either male or female, were kept well out of sight in the kitchens or at least hidden away on the other side of the serving hatch or screen. Again it's a young Henry VIII dining, presumably in private, with two very high ranking guests - the Holy Roman Emperor Maximillian I, and Ferdinand I Archduke of Austria. I don't understand the heraldry but I assume Max is closest to the king and Ferdy, being just an archduke, is furthest away, although I do note amongst the attendants an Imperial herald wearing a tabard displaying the double-headed Imperial eagle. Excellent posts, MM - thank you. Brill pictures and explanations. While some lurk at the Naughty Pillar, you collect all the gold stars!! PS So it was the King of Portugal and John of Gaunt was it - at least I was in the right century! 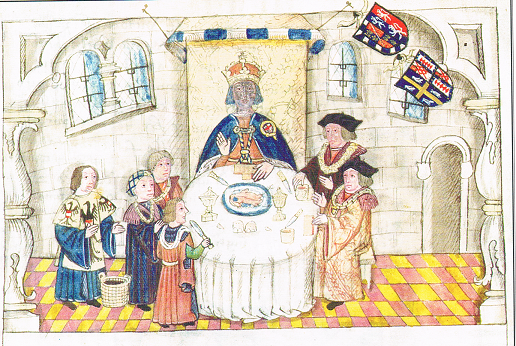 EDIT: Just seen latest - where did you get all these Henry VIII dining pictures from - I've never seen them anywhere! You need to have a bigger picture to clearly see the arms of Portugal and of England (Gaunt) above the figures. 'Food and Feast in Tudor England', by Alison Sim (1997) ISBN 0-7500-1476-9. 'Food and Feast in Medieval England', by PW Hammond (1993) ISBN 0-86299-794-1. I can thoroughly recommend both books if the history of food and dining is your thing. PS I think those two pics are Henry VIII (and note they are actually top and bottom of the same drawing). I did initially think they were Henry VII until I considered the context and the likely dates ... the caption in the book isn't at all clear as it is actually illustrating dining practices rather than describing the who, when and where, so it doesn't say which figure was the Emperor, which the Archduke nor who all four Mark Rylance figures were. I'm not even exactly sure who was being invested: Henry (VII or VIII) is certainly wearing the Garter robes, and the caption (to both pictures - remember it was I that separated them) says it is the Emperor and Archduke who are being invested. Nevertheless the book does give the manuscript reference (it's a document held by the College of Arms - MS 152 p 178). I've got the Alison Sims book, MM, but I can't find the images. Mine is only a paperback - 2005 - so maybe you have an earlier edition with more pics. It definitely does look like Mark Rylance's hat, but I'm not sure it's Henry VIII, but then again perhaps it is. Got to go out now, but will check up on the Max 'n' Ferdy investiture thing later - unless someone else does! 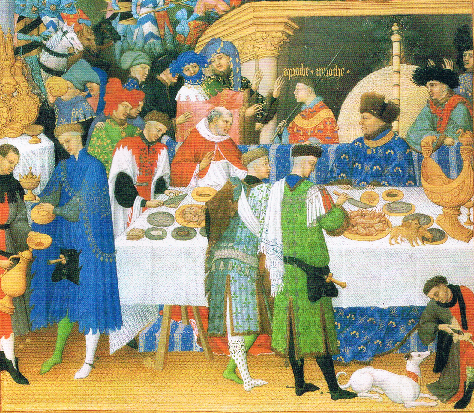 Have you got Food and Feast in Medieval England by P.W. Hammond - some of your pictures are there. Only the paperback, mine's the hardback, 1997 first edition ... with numerous colour plates! Seriously though I think it is easy to read too much into such pictures. For example, the Portugal/Gaunt picture which appears on the face of it to depict a fairly intimate, almost chummy meal between six high ranking nobles, in reality might well have been part of a huge banquet. All the numerous lesser ranked people, sitting on side tables down the length of the great hall, were perhaps considered of so little importance as far as the official artist was concerned, that he depicted the top table alone and omitted everyone else present ... Although I think it unlikely that even the two lowest ranked diners on the top table, who after all are still both bishops, would actually have been sat with their backs to the throng. I find it less easy to suppose there is a huge hall of other, out of sight diners in the two Henry VIII pictures, as the few people depicted appear to be seated 'around' the table rather than along it. 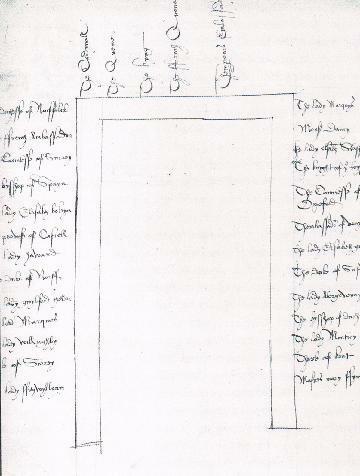 But at the end of the day those two representations are fairly simple sketches made to illustrate, not an accurate historical chronicle, but rather an heraldic record of various coats of arms (and sketched in by whom I wonder?). So I doubt they can be taken as faithful depictions of what actually occurred. And yet they would probably be seen as plausible by people of the time, and perfectly acceptable as good representations of the sort of practices that were commonly seen. The one of Henry surrounded by a quartet of Mark Rylances is interesting but since the table appears to be square I'm not sure he could strictly speaking be said to be at the head of it. One has to remember the painters of such scenes, such as that of le Duc de Berry at dinner - which was taken from le Duc's own specially commissioned Book of Hours, Les Trés Riches Heures - were foremost painters and not cooks, servers nor whatevers ... hence the carver in green wielding his knife with a very un-natural underhand grasp, and all the more odd as he seems to be just dividing up some roasted quail or similar small birds. The artists of course were also subservient to how their patron, in this case the all powerful duke, wished himself to be portrayed. Regarding the rest of the scene, don't forget that while a genteel meal is the main focus here, in the background of the whole picture there is a huge allegorical battle raging complete with horses and mounted knights in full armour (which I chose to cut out for the purposes of this thread). 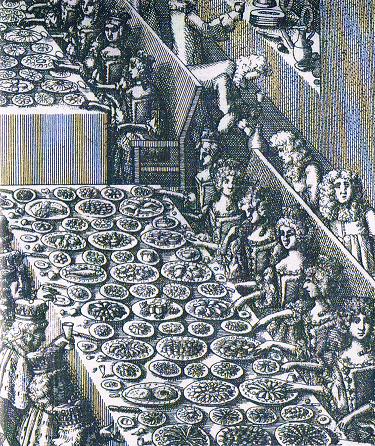 But the portrayal of usual details I think is probably correct, such as the separate tasks of pouring wine and carving the meat, the spare tenchers on the table (those are bread trenchers the little dogs are nibbling not food on platters) and the Duke's table being raised up on a platform. But also having said that servers were nearly always well-bred young men, I'd have thought the chap next to the carver would have tried to get a matching pair of socks ... seems you just can't get the staff, even if you are uncle to the king of France! And have you noticed the thuggish bruiser with the stick of office standing behind the Duke? I'm guessing he is the steward of the table, the maitre D, the master of ceremonies, and in short the all important chap who decides exactly where you sit, how high up the table or how low .... and his presence in this picture alone suggests that there were in reality maybe a hundred lesser folk usually present at the Duke's dinner .... but not one of them warranted inclusion in the picture. Oh, MM, please don't put your tongue out at me - I wasn't being a book snob, honest. And I know I'm a Tudor-book-bore: I can't help it . Will just add info below, then will shut up for a bit. You were dead right: it is Henry VIII and it is Ferdinand of Austria who is being honoured with the Order of the Garter. He was invested in 1524. But what's odd is that Maximilian (Holy Roman Emperor) was dead. He died in 1519 when Ferdy's brother, Charles, took over running most of the world. Ferdinand and Charles were Maximilian's grandsons. Henry must have been best friends with the Habsburgs at that time, having had one of his periodic fall-outs with Francis. Ferdinand is Garter Knight 279. PS When looking at the Garter list I was pleased to see Mark, Lord Cromwell, in at 299. Odd he's still there - thought they'd have removed him when he was disgraced and attainted. Well done for sorting that out ... but who I wonder are the four Rylances depicted in the same illustration - they are on the same manuscript page, there's a border drawn around both illustrations and the whole is described as the investiture of Maximillian and Ferdinand. M and F are clearly depicted in the upper scene, but who are the other four stooges I wonder? You stay on the list so that people can see to what heights you rose before you fell - a permanent reminder of disgrace. To emphasise that, in St George's Hall at Windsor Castle all the Garter Knights' arms are displayed, but although the 'degraded' knights have their shields in place, they have been blanked out. It's no surprise that the largest cluster of blank shields appears under the Tudors. The ceremony of degradation in St George's Chapel must have been quite dramatic to witness - the offender's crimes announced, their sword broken over their head, their banner and crest (displayed over their stall in the Quire) cast down and kicked into the Castle Ditch by the Heralds to lie with the other rubbish. Pity we don't do something similar to the disgraced who have scrambled for the Honours list behind a cloak of awful misdeed. With a bit of googling I think I've worked out who most of the key people are (my deductions, some a lot more obvious than others, are in parentheses) ... Oh, Temp where are you? I need some help! It's all rather dominated by the Howard family isn't it? And what a nightmare to have to work it all out allowing for the demands of rank and protocol. But it's interesting that his Grace the Duke of Norfolk (Earl Marshall of England, no less), is sat halfway down the right-hand table while his wife heads that table being only just "below the salt". In fact looking at the placings I get the feeling that it wasn't just a simple case of how far you were from the top table, but almost that there was a top place to each side table, located in the middle position, similar to the king sitting in the middle of the top table. The Duke of Norfolk sits in the middle of the right-hand table, while Charles Brandon, admittedly a bit of an upstart but nevertheless married to the King's sister and a Queen of France as well, sits in the middle of the left-hand table. So I suspect as ever there was a lot more going on than just who's "higher" up the table, and how far you were "below from the salt". I note also that while a strict male-female-male-female seating is observed, no married couples sit together (other than the King and Queen) indeed couples are likely to be on different tables ... it all depends on rank: a duchess outranks an earl while an earl's wife is lower than another earl, but an ambassador can outrank even a duke if he's the guest of honour. And at that banquent there must have been some very interesting conversation. If I've interpreted them correctly I see that Charles Brandon is sat next to Elizabeth Grey, Vicountess Lisle, who, as his eight-year-old ward, had once been (slightly scandalously) betrothed to him ... until he jilted her and married Louis XII's widow instead! And if I've correctly identified "Lady Guildford the elder" as Joan Vaux, often known "Mother Guildford", then she was the governess for the young prince Henry as well as his older brother, Arthur, and younger sister Mary. Joan would later famously give damning evidence that Arthur had confided in her on the morning after his wedding night, to say that he did indeed "have knowledge" of Katherine of Aragon. Wouldn't you just love to have been there listening to all the conversations, gossip and intrigues? The banquet at Greenwich, on St. Thomas's Day, 7 July 9 Hen. VIII. Carver to the King, Sir David Owen. Cupbearer, Sir Nic. Carie. Sewer, Sir Wm. Kingston. Sewers for ten messes named. Their own servants to attend on the Ambassadors and give them drink. For the ordering of the boards, warning the officers, and keeping the barriers while the service comes in, Grey and Lee. Four men to keep the door during the banquet. To keep the door while the service comes in, 2 men, and the same for the other door. To hold torches during the banquet on the other side of the barriers, 16 men; after the banquet is done, within the barriers, 10. Two to keep the barriers at the stair head. Lords Abergavenny, Fitzwater, Willoughby and Ferres to hold torches while the King washes. To bear towels and basons: for the King, the Earl of Surrey; Lords Ric. Grey, Leonard Grey, and Clinton, Sirs Maurice Barkeley, Edw. Darell, John Semer, Griffith Ap Rice, Arthur Hopton, Ric. Lewis, John Ranieford, Roger Wentworth, Wm. Walgrave. All the gentlemen to be ready to serve the lords and ladies with drink. Four yeomen to take up the boards. Three sewers and two grooms to attend on the almoner and remove dishes. Four grooms to set forms and stools. To attend on the King's chair and the Vice-chamberlain (no names). To help the Vice-chamberlain in the ordering of the company, Sirs Thos. Perre and John Peche. "Item, the almoner to be warned to wait upon his room." A place to be provided outside the door for the livery, pantry, and chaundry. The serjeant of the scullery to have a basket in a corner behind the door, "to avoid the meat, and receive the dishes of silver," and men ready to take them away. To attend on the ambassadors in their lodging, Sir Edw. Grey, gentleman usher, Ric. Pole, usher, 2 yeomen, and a groom. To serve the French King's ambassador, Sir Christopher Garnish and 4 others. Mons. Daucie, the King of Arragon's chief ambassador, the Knight of the Toison, the Bp. of Spain, the Provost of Cassel, and the ambassador of Venice, a gentleman usher, usher, two yeomen, and a groom each. Geffrey Gough, Jeffrey Villers, to keep the watch chamber door. Sewers for the King, Sir Wm. Kingston; to attend on him, the Lord Edmond Haward, Sirs Edw. Hungerford, Wm. Paston, John Heydon, Ric. Weston, Edw. Ferres, Edw. Grenvile, Rob. Constable, John Dauncy, Ph. Calthrop, Thos. West, Mathew Browne, John Veere, Ric. Wentworth, Adrian Fortescue. For the Queen, her own servant; to attend on him, Lord John Grey, Sir Thos. Tyrrell, Wm. Scot, Ralph Verney, Edm. Bray, John Foge, Wm. Crowner, Wm. Waldon, Rob. Brandon, Christopher Willoughby, Wm. Barentine, Wistan Browne, Thomas Denys; Edm. Willocke, Bourchier. At the third mess, the French Queen's servant; to attend on him, Sirs Wm. Parre, Geo. Horny, Wm. Husee, Hen. Owen, Edw. Walsingham, Rob. Jones, Geffrey Gates, Wm. Sidney, Rafe Chamberlain, Ric. Cornwall, Thos. Lucye, Anth. Poyntz, John Zouch, Giles Chapell, John Hungerford. At the fourth mess, the Cardinal's servant; to attend on him, Sirs Edw. Bensted, Wm. Essex, Randolf Brereton, John Werberton, John Gainsford, John Dawtrey, Godard Oxenbridge, John Norton, John Hampden, Wm. Rede, Edw. Chamberlain, John Chaine, John Lyle, Anth. Wingfield, Thos. Cheyne. At the 5th mess, Henry Penago; to attend upon him, Sirs John Fortescue, Wm. Gorge, Walter Stoner, Giles Allington, Wm. Pole, Thos. Berkeley, Hen. Chirburn; Wm. Husee, Anth. Knyvet, Thos. Tempest, Poole, Forster, Kevill, Vavasor, Seward. At the 6th mess, Nic. Hide; to attend upon him, Sir Ric. Vaghan and 14 others. At the 7th mess, Willesburne; to attend on him, Sirs John Barker, Ric. Fowler and 13 others. At the 8th mess, Welden; to attend on him, Sir John Stanley, Wm. Tyrell, John Morton, Thos. Cardigan, Geo. Sutton, Owen Holland, Francis Philip, Gerard Sotehill, Edw. Skerne, John Lawrence, the Queen's servants, Seymour, Pennington, Torell, Streland, Tailboys, the Cardinal's servants. To attend on the sewers of the 9th and 10th mess, 11 of the Cardinal's servants, names given. Thank you for your two posts, MM - absolutely fascinating stuff. ...(note how many of these cup-bearers, carvers, hand-washers etc are themselves from aristocratic families...). Yes, and sometimes aristocratic fury and hatred overcame courtly manners, and appropriate ritual was abandoned. On one occasion when the Cardinal - seen by many of course as a jumped-up, low-born ecclesiastic - ventured to wash in the same basin which Buckingham was holding for the king, it is reported that the Duke lost it completely and deliberately poured the water all over Wolsey's shoes. The Cardinal, furious, had to hurry off to get a change of footwear. Henry found the incident hilarious by all accounts, and laughed with Buckingham about Wolsey's discomfiture. No doubt the cardinal recalled the incident with a certain grim amusement of his own when Buckingham was later executed. I wonder if there is something seriously wrong with me, that I can become excited looking at a seating-plan for a meal that happened nearly five hundred years ago? Well that's two of us. I came across the sketch of the seating plan in Alison Sim's "Food and Feast in Tudor England" (1997), an admirable book that's been mentioned earlier in this thread. I could just read the titles of the top-table people, and then intrigued, managed to find a transcript of the titles of all the others, casually listed amongst some state papers (published in book form in the early 19th century and now viewable online via google books) ... and which erroneously moved Lady Marques from top of the left-hand table to the bottom of the right (she probably would have been hugely insulted if she'd known). But then I felt compelled to match names/individuals to the titles, and so try and work out who was sitting next to who, and in terms of the OP to try and work out the reasons for their places in the overall scheme. Entirely separate, and in a different set of online state records, I came across the minutes of the meeting to agree who were to be the servers, whether the ambassadors would use their own servants, who was to be in overall charge etc... (I say "minutes" because it reads like an agreed plan made just before the event, although it is actually classed as the official record made after the event. In reality I think it's probably a bit of both). I wonder if there's a record of what was actually eaten. But of course not everyone would necessarily get the same food. The 'messes' (there were ten at the above banquet) in addition to the top table, might have been given different dishes depending on their rank. And not just lower status dishes but possibly less of them as well. Just weeks earlier (31 May 1517) regulations had been laid down which stated that a cardinal could get nine dishes served at one meal; a duke, archbishop, marquis, or earl could have seven; lords "under the degree of earl", knights of the garter, and abbots could have six; ... and so on, down to those with an annual income of between £40 and £100 who could only get three dishes. Though I don't think anyone would go hungry ... "a dish" meant one swan, bustard, peacock, goose or other "fowls of like greatness"; or four plovers, partridge, woodcock or similar (except for a cardinal who was allowed six); or eight quail or dotterels; or twelve very small birds like larks ... it's not clear if these regulations are per person or per mess (ie to be shared between perhaps four people) but I rather suspect it's the latter. Either way the tables must have been groaning with food. Hence, it seems, the note in the arrangements of the St Thomas feast for, "The serjeant of the scullery to have a basket in a corner behind the door, to avoid [clear/remove] the meat, and receive the dishes of silver, and men ready to take them away." ie a basket into which all the left-overs could go ... all of course to be later distributed as alms. Sebastian Giustinian (Venetian Ambassador) to the Doge, 10 July 1517. After dinner, his majesty took this ambassador into the Queen's chamber, and made her and all those ladies pay him as much honour as if he had been a sovereign, giving him amusements of every description; the chief of which, however, and the most approved by his Majesty, was the instrumental music of the reverend Master Dionysio Memo, which lasted during four consecutive hours, to the so great admiration of all the audience, and with such marks of delight from his Majesty aforesaid, as to defy exaggeration. Returned next day to London. Everybody is talking of the late entertainment". Niccolo Sagudino (Secretary to the Venetian Ambassador) to Alvise Foscari (a Venetian diplomat), 11 July 1517. "After the joust was a banquet, and at the head of the hall sat the King, between the Queens of England and France, and with them the Cardinal; at the side the ambassadors, with the handsomest ladies. In the centre of the hall there was a stage on which were some boys, some of whom sang, and others played the flute, rebeck and harpsichord, making the sweetest melody. The banquet being ended, the King and the guests above mentioned betook themselves into another hall, where the damsels of the most serene Queen were, and dancing went on there for two hours, the King doing marvellous things, both in dancing and jumping, proving himself, as he in truth is, indefatigable." What I don't understand is that these two letters (or rather copies of them), plus a huge amount of similar correspondence between other ambassadors and their governments, are all enclosed in British state papers. Were foreign diplomats expected to give copies of their letters to English court officials, or were all letters being opened and copied before being despatched? I've looked, but I can't find any details of the food served. But did you know that Katherine of Aragon was - unusually for the time - very fond of salad? I wonder what exactly would have gone into a Tudor salad? I have no idea if lettuce, radish, cress etc. - our usual salad stuff - were around in the 16th century. Salat: Take persel, sawge [sage], grene garlec, chibolles [chives], oynouns, leek, borage, myntes, porrettes [a type of leek or scallion], fenel and toun cressis [water cress, I think], rew [rue], rosemarye, purslayne. Laue and waisshe hem clene. Poke hem, pluk hem small wiþ þyn hond and myng hem wel with rawe oile. Lay on vynegar and salt and serue it forth. Columbus may have brought tomatoes back in the 1490s but they aren't mentioned until the 1540s as being grown in Spain and Italy, and they were not cultivated in England until the 1590s. John Gerrard's Herbal, published in 1597 acknowledges that tomatoes were eaten in Spain and Italy, but cautioned that he believed them to be poisonous. Aren't tomatoes of the deadly nightshade family? I wonder if Gerrard knew that? Tomatoes are indeed members of the nightshade family, as are potatoes too. Gerard's Herbal was actually largely plagarised from Rembert Dodoens's 'Herbal' of 1554. I don't think 16th century plant classification was particularly sophisticated, but both Gerard and Dodoens probably recognised that the leaves, flowers and fruit of tomatoes, especially the varieties then known in Europe which had much smaller fruit, closely resembled deadly nightshades. "On the table was placed a centre-piece, which represented a green lawn, surrounded with large peacocks' feathers and green branches, to which were tied violets and other sweet-smelling flowers. In the middle of this lawn a fortress was placed, covered with silver. This was hollow, and formed a sort of cage, in which several live birds were shut up, their tufts and feet being gilt. On its tower, which was gilt, three banners were placed, one bearing the arms of the count, the two others those of Mesdemoiselles de Châteaubrun and de Villequier, in whose honour the feast was given." "The two last dishes were covered with a German sauce, with gilt sugar-plums, and pomegranate seeds. At each end of the centre-piece (described above) outside the green lawn, was placed an enormous pie, surmounted with smaller pies, which formed a crown. The crust of the large ones was silvered all round and gilt at the top. Each pie contained a whole roe-deer, a gosling, three capons, six chickens, ten pigeons, one young rabbit. To serve as seasoning or stuffing, a minced loin of veal, two pounds of fat, and twenty-six hard-boiled eggs, covered with saffron and flavoured with cloves." A jelly, part white and part red, representing the crests of the main guests. "Besides these four courses, there was a fifth, entirely composed of the prepared wines then in vogue, and of preserves. These consisted of fruits and various sweet pastries. The pastries represented stags and swans, to the necks of which were suspended the arms of the Count of Anjou." Gives me indigestion just reading it, and what about their five-a-day? MM, thank you for that menu. Re your reference to five-a-day - I read somewhere that the peasants' diet - when food was available - was actually really healthy. Lots of fresh veg, little meat, coarse brown bread and the odd egg now and again - and maybe a bit of bacon. Fruit and nuts, too, but no rich pastry and no sugary stuff. Just a bit of honey, if you were lucky. The average aristocratic bowel must have been in a terrible state! I enjoyed reading that, Trike - thank you for the link. I notice porridge was mentioned as a staple source of carbohydrate for the labouring classes - forgot to mention that in my post last night! Again, good healthy stuff! Lots of whole grains, too, such as rye and barley. I suppose the latter would be used not just in bread, but could also be added to the vegetable "pottage" - not sure about that, though. "Posh" white manchet bread no doubt contributed to Henry VIII's terrible constipation (which is noted in his medical records) - one of his wives and/or his doctors should have made sure he got some decent roughage in his diet. Sone rye bread would have done the trick - much more effective than all the rhubarb medicine they gave him. The groom of the stool might have had an easier life too! Thanks to the imagination of many and a few old films, there still appears to be a misunderstanding of medieval table habits. In fact, they were likely to be far more strictly tidy than our own modern more casual practices. The use of clean linen, including a very large starched napkin placed across the left shoulder, was essential. This was a detail shown in the BBC's Wolf Hall: the diners, whether in the middle-class Cromwell household, or at the more aristocratic meals, all had the starched napkin over the shoulder - even the women. I didn't know about that custom when I saw it on the television, so it was interesting to have it confirmed in the blog you have directed us to. Returning to the OP (about the placing of people at a formal Tudor meal) … and returning also to the St Thomas Day banquet (don’t all groan!) … I think I’ve got it sorted. Firstly the context. A treaty of mutual peace between England, Spain and the Holy Roman Empire had been agreed on 29 November 1516. Seven months later, after some wrangling about the exact wording and the usual delaying tactics of the Emperor as he tried to gain advantage by playing the others off against each other, it was ready to be finally ratified. Charles of Spain despatched a diplomatic team from Flanders and the treaty was duly signed by Henry VIII, in a ceremony on 5 July 1517. The St Thomas Day banquet was to celebrate this. James of Luxembourg, Lord d’Aussy. He was described by the Venetian Ambassador as: , "a youth about twenty years old and extremely handsome … He is the boon companion of the King Charles, and shares all his secrets as familiarly as if he were his brother." James could trace his immediate descent from the Dukes of Burgundy, his father was the governor of Flanders (Lord Fiennes, a family with old links to the royal line of England), and he had just married a niece of William of Croy-Chievres, First Chancellor to King Charles. Bernard of Messa, the Bishop of Elne (then in Aragon, now in SW France, just down the road from me). "The Knight of the Toison" that is the Toison d’Or, the Order of the Golden Fleece, a prestigious chivalric order. I think this might have been Charles of Croy, Count of Chimay, Stadtholder of Hainault. The only other person present in the order was Henry VIII. George de Themisteke, The Provost of Cassel, the lowest ranked of their delegation. Ambassador for the Holy Roman Empire, Johannes Hedyn, Count of Decian … representing Maximillian I, the third signatory to the Treaty who was the main reason for the delays since it was the emperor that insisted on deleting some of the clauses. As ambassador to an emperor he's the highest ranked diplomat present, and treated as the principal guest of honour. The Ambassador for France. The treaty that everyone was celebrating was deliberately directed against the French and even while they all sat there sampling the roast swan, France was moving troops north to threaten Flanders. All the more reason to invite the French Ambassador and show him this display of Anglo-Spanish-Imperial solidarity. The Ambassador for Venice, Sebastian Giustinian (to give report back to all Italy). …. And of course Cardinal Wolsey, who as a Cardinal outranked everyone except the king and two queens. As well as having been the prime negociator of the treaty for England, Wolsey, as Papal Legate also represented the Pope, who had effectively sponsored the treaty initiative as part of a move to create a new Holy League. And now the seating plan all makes sense bearing in mind it was to be male-female-male-female (this may have been a slightly unusual arrangement since the Venetian Ambassador felt the need to explain it). 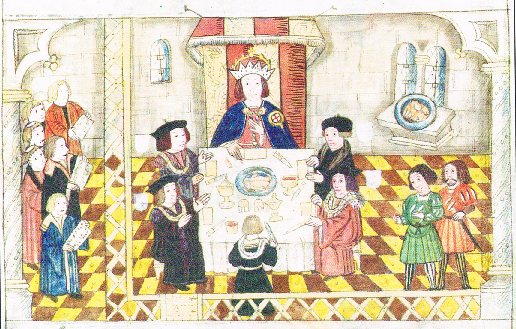 ….etc, and hence why the Thomas Howard, Duke of Norfolk is eighth down the right hand table. He’s the highest ranked English nobleman, just above Charles Brandon, the Duke of Suffolk (opposite him), but both sit below all the honoured diplomatic guests, including the fairly lowly Provost of Cassel. … and so down to bottom left, the lowest ranked woman (Mistress Fiennes, Lady Norris, although she was still a cousin of both Ann Boleyn and Catherine Howard). OK I'll shut up about that banquet now. Please don't. This is research worthy of the great Mantel herself. Call that a great Mantel? Now THIS is a Great Mantel! If you're ever in Cheshire - down Congleton way - then you must visit Little Moreton Hall. Yes but as I said above, that plan is taken from a 19th century transcript (in a published volume of state papers). If you compare it to the original sketch drawn in 1517 (it's in the library of the College of Arms) you'll see that the transcript version erroneously moves Lady Marques from the top of the left-hand table to the bottom of the right (she'd have been grieviously insulted!). The error probably arose as a simple type-setting error ... but it changed the original symmetrical arrangement with 13 people on each side table, to that above with 14 people on the right table but only 12 on the left ... and by doing so it also causes two women to be sat next to each other, which from the report of the Venetian ambassador who was there, was not the case. The queen dines and sups alone with very few attendants; and it is very seldom that any body, foreigner or native, is admitted at that time, and then only at the intercession of somebody in power." And talking about regal dining I've just discovered this little snippet about James I (1566-1625). He was of course famously opposed to that popular herb tobacco. A man ahead of his time in warning of its dangers, in his 'Counterblaste to Tobacco' (1604), he denounced it as "… a custome loathsome to the eye, hatefull to the Nose, harmefull to the braine, dangerous to the Lungs, and in the black stinking fume thereof, nearest resembling the horrible Stigian smoke of the pit that is bottomlesse." It appears that the king also disliked a couple of popular dishes of the time almost as much as he disliked tobacco. He once said that should he invite the devil to dinner he would serve these three dishes: "a pigge; a poll of ling and mustard; a pipe of tobacco". So, James did not like pork ... that must have put a bit of a strain on the royal kitchens, pork being such an important meat of the time. Ling is a type of cod, and was also very common and popular at the time. A poll, or jowl was the head and shoulders of the fish – considered by many to be the best part. Was it just the poll he hated, and would he have been happy with a fillet? Or was it the mustard sauce he disliked? I'm sure I read somewhere that Lucullus only ate the 'pearls' of his trout - the cheeks I suppose we would call them now. Fish cheeks (and pork and ox) cheeks are achingly trendy these days and have become stupidly expensive. Nothing displays one's discernment and understanding of the current culinary fashion like spending exorbitant sums on fancied up versions of starvation rations, it seems. I do like pork cheeks though, I've some in freezer from, where else, Waitrose and I must cook them soon. Starvation foods - fashion - what's in and what's out - and the whole status thing about food is very interesting. I read recently (somewhere online but I can't now find it) that in New England, even well into the 19th century, lobster was so abundant that it was considered peasant food, and that poor families would carefully bury the remains of their lobster meals so that word wouldn't get about as to how low they had sunk. During the 18th and early 19th centuries, Essex oysters, Thames sprats (as whitebait), and Thames eels (in pies) were so cheap and common in London as to be dismissed simply as working class food. Now they all command premium prices. As late as the 1970s I can remember my mother (the daughter of a fisherman) buying monkfish as a much cheaper, but perfectly good, alternative to more acceptable and more expensive "proper" fish like cod, plaice and haddock. But now as 'queue de lotte', monkfish is very fashionable, much esteemed and accordingly very expensive. Even nettles, dandelions and humble garden snails, all of which have sustained countless generations of ordinary folk, are now seen as gastronomic delicacies demanding premium prices. 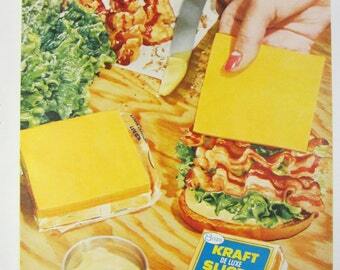 Clearly it is (and ever was) as much about style, fashion, novelty etc.... than just edibility. Have you ever eaten roast peacock? I have and frankly it's as tough as very old shoe-leather. But getting hold of one, and getting hold of a chef that can cook it, lends one a certain caché ... whether you are a 14th century king, or a 21st century gastro-celeb owner of a classy restaurant with a TV franchise to support. I know a fish and chip shop owner who bought ugly monk fish by the box load for next to nothing to pass off as scampi tails at the time when buyers fresh from those heady jaunts to Spain sought them . His 'scampi' was a great seller. carefully cut to shape, the translucent flesh was right and the taste far superior than scampi sold elsewhere - but it was a great secret and one from which he made a real fortune. I note in the extraordinary wedding menu MM you put in above that brawn and mustard were high on the list. How I miss that rich and nutmeggy taste - can't get it here now. Sprats are still liked about here but really should be cooked outside. For one thing the fishy smoke sets of the fire alarm and the place reeks for days. P, I think you can still get potted heid in a few butchers up here and potted hough is widely sold although these are beef rather than pork It's a long time since I tasted either but I can still quite clearly remember the taste, a lot of white pepper mostly, and the jelly. Heavy sigh of memory here. Nutmeg was the 'secret' flavour - as indeed it is in lots of things. .... boiled spinach for one. I’ve just come across the 'festival book' for the coronation of James II and Mary of Modena, held on 23 April 1685. This is the official history of the whole event; the coronation in Westminster Abbey, the coronation banquet held afterwards in Westminster Hall, the royal pageant on the Thames, and the final fireworks. "The History of the Coronation of the most high, most mighty, and most excellenet monarch James II, by the Grace of God, King of England, Scotland, France and Ireland, Defender of the Faith, &c. and of his most royal consort Queen Mary: solemnized in the Collegiate Church of St Peter in the City of Westminster, on Thursday the 23 of April, being the festival of St George, in the year of our Lord 1685." Published By his Majesties especial command. By Francis Sandford. 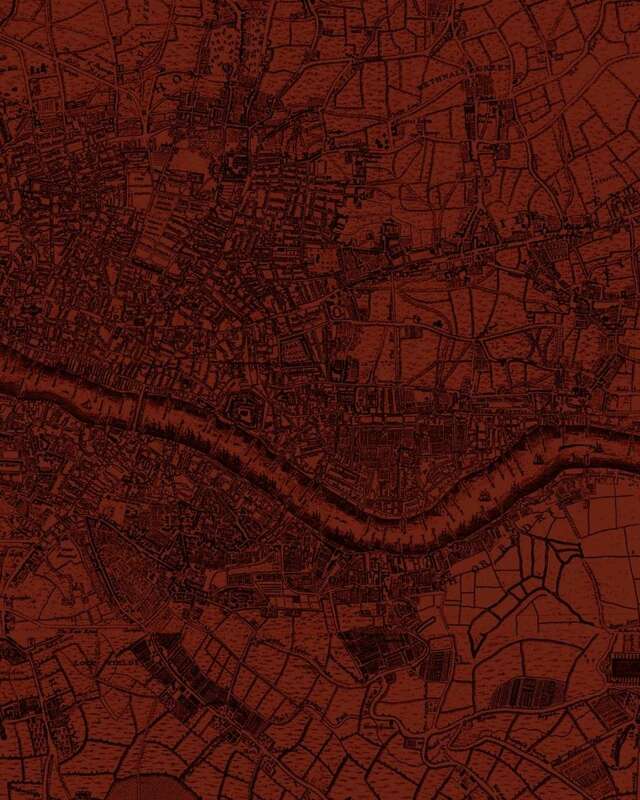 London: printed by T. Newcomb, 1687. The whole book with all it's illustrations and plans can be viewed online (the coronation banquet is covered by pages 196 to 216). 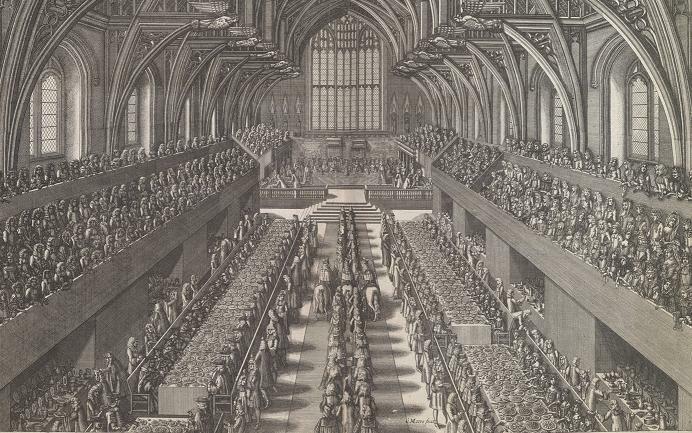 Prior to the day, the courts and offices were removed from Westminster Hall and it was furnished with the royal table at the top of the great stairs and two rows of tables stretching almost to the north door. At the sides of the Hall 16 huge cupboards were erected for dishes and cutlery. On the day, participants had to be present by eight in the morning and were marshalled into the Hall in columns. When the King and Queen entered the Hall (at 11.30am), they were presented with the sword of state and the coronation regalia, and were subsequently borne in procession to Westminster Abbey. Once the procession had departed, the tables were laid and the dishes of cold food (which was nearly all the food provided) were set out. Once the coronation service in Westminster Abbey was over, everyone returned to the Hall for the banquet. During the banquet, the King and Queen sat in splendid isolation at the royal table, wearing their crowns. At the other tables sat peers and peeresses, bishops, judges, barons, the King's Council, the Lord Mayor and the heralds; they were attended by about two hundred servants (each nobleman also had one of his own servants present). The first course consisting of 46 dishes of hot meat was brought in by a procession of 73 people, including three officers on horseback. Then the king's champion entered the Hall on a white horse. Dressed in white armour, he threw down his gauntlet three times, challenging anyone present who disputed the King's right to succeed. The King then drank to the champion from a silver-gilt cup, which he gave to the latter as his traditional fee. Everyone then tucked into the remaining cold dishes which were already on the tables. The banquet concluded at about seven in the evening when their majesties could finally take off their heavy crowns and withdraw from the public gaze. Here’s the engraving of the banquent itself depicting "… the manner of Serving the First Course of Hot Meat to their Majesties Table." There’s a huge amount of detail in this book but a couple of things relevant to this thread I found particularly interesting. This arrangement is reflected in the order at which the guests were ushered into their seats. It seems that there was no attempt at any seating plan arranged in advance, but that on the day for each table, people were assembled in a line by rank and then ushered into place. I'm not sure if precedence would necessarily rank a wife in the same order as her husband (what about unmarried nobles? ), so if one wanted to sit opposite one’s wife (or ensure that one didn’t) one just had to sort it out at the time. I suspect that although everyone was supposed to be seated in strict order of precedence there was probably quite a lot of swapping places, pulling rank, and shuffling up and down, particularly as everyone sat on the same long bench which had a high back and so it was impossible to just hop over it. This high back must also have made it very hard for the servants to top up the wine glasses (every guest had their own dedicated servant for this) and place the hot dishes in place when they arrived from the kitchens. Furthermore, since the whole event lasted several hours, how did those with weak bladders manage? The second point is the huge number of dishes, all on the table at the same time, with sweet desserts alongside savoury dishes, hot alongside cold, fish next to flesh, salads next to custards, and all placed in rigid symmetry (it's called service à la française), ... but differing between tables and even along the tables, depending on the rank of the particular guests. 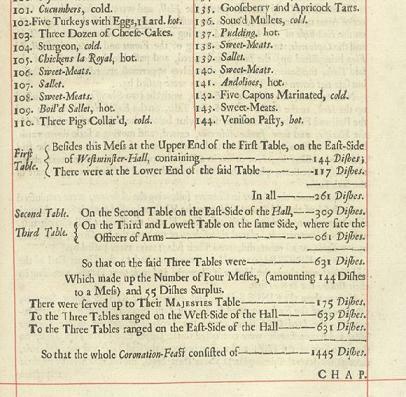 Hence the detailed table plans cross-indexed to a numbered catalogue of all the dishes. "Their Majesties Table was furnished by Patrick Lamb Esq. the Kings Master Cook, with an Ambique of 99 Dishes of the most Excellent and Choicest of all forms of Cold Meats, both Flesh and Fish, excellently well Dressed and Ordered all manner of ways, which were brought up by the Gentlemen who served at Their Majesties Cupboards. And in three very long Chargers, and 14 large Basins, Dryed Sweat-Meats, and Plates of all sorts of Jelles, Blancmange &c. with Sallads of all kinds, were likewise brought up; and all the Provisions served in Dishes of Proper Sizes, with Plates and Glasses to fill up every little Vacancy between the Dishes, which were set upon Stands of several heights, and all so equally mixed that it made an extraordinary good appearance; and every part of it most delicious and admirable Foods: And void places were left for the Hot Meats, which was to be served up after Their Majesties return into the Hall [ie after the coronation ceremony in the abbey]." There are so many dishes that, apart from the top table, most of the food was of cold dishes. Only their majesties and the highest ranked guests on the first table got more than one or two hot dishes, and by the time these hot dishes had been ceremonially brought in, presented and placed in their allotted position on the table, the food, even that served to the King, had probably gone cold. Furthermore the tables were quite wide so that it would have been tricky, while dressed in full robes of state, to reach the dishes in the middle of each table, so a lot must have gone untouched, presumably to be distributed as arms to the poor. It's also interesting that as well as the guests themselves there was a huge crowd of spectators in the upper galleries, just there to watch others eat. It's a fascinating document and I have happily wasted the best part of the morning flicking through it. Of course although it claims to be a permanent, unalterable and factual "history" of the festivities, it wasn’t published until 1687, two years after the coronation took place. Although his ascension to the throne was uncontested, by the time the book appeared James II had become unpopular with Parliament and the public alike. 'The History of the Coronation' is therefore less an authoritative history than an attempt to recuperate James' reputation and solidify his threatened sovereign power. However I suspect the details of the event are still largely correct. There are many other festival books available to view on-line covering a variety events, royal courts or civic organisations throughout renaissance Europe (although of course most are in a language other than English). I’m afraid I've rather turned this discussion into a bit of a monologue - I do apologise - but it has piqued my interest and prompted me to delve down some of the rather more obscure back-alleys of historic food, feast and fast. And I’ll admit that I was right chuffed when I found out the exact date and the names of all those bishops at the "John of Gaunt dining with King John of Portugal" feast (pictured above and on the dish-of-the day for 9 May 1385). But I do sometimes ask myself, as Temp once also wondered: is there not something slightly odd about getting excited by putting names to faces in an old painting or written seating plan; of trying to work out the exact date; what exactly is being depicted; working out who sat next to who; and wondering whatever were they were all talking about? Perhaps I am a bit odd. But anyway, putting aside my deliberations on the dish-of-the-day thread about exactly who sat where when John of Gaunt dined with King John of Portugal in 1385, ... just to bore you all further, I’ve now discovered this account of the feast at the 1421 coronation of Catherine of Valois, Queen of Henry V.
"The Queen, at table, had the Archbishop of Canterbury on her right, and Henry Cardinal of Winchester on her left. ….. The Barons of the Cinque Ports were at the head of the table on the right of the Queen, towards St. Stephen's Chapel, and the Bowchiers* of the Chancery were below them at the same table: at a table on the Queen's left sat the Lord Mayor and Aldermen of London. The Bishops were at the head of the table next to that at which the Barons of the Cinque Ports sat, and the Ladies had a table next to the Lord Mayor's table." (*Bowchiers were, I think, a particular high rank of Chancery lawyer). Sir Richard Neville as Carver. Lord Grey of Ruthyn as Naperer. ….. But where were all the other peers of the realm? Where indeed was her husband, King Henry V, who didn't leave England for France (to continue the military campaign) until June? 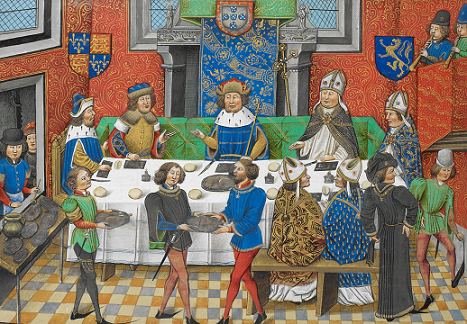 Or did 15th century protocol make a queen’s coronation banquet (and of course she became queen by marriage some years after Henry's accession to the throne) primarily a civic and ecclesiastical do – was "The City" the traditional host for such an event? Any ideas? The "Bill of Fare", ie the menu, is interesting too. As it was St Matthew’s Day it was an obligatory fast day, and so the feast was entirely of fish, or at least non-meat, "with the exception of Brawn with Mustard in the first Course." "The Feast, as usual, was of three Courses, which were of the same character. Whale was served in the first Course: in the second was a Leche damask* with the king's motto flourished on it, which was Vne sanz plus**; meaning of course the Queen. In the third Course was Porpoise, and in this Course was a subtlety of a Tiger looking into a Mirror, with a man on horseback fully armed, grasping a Tiger's whelp." *Leches were tarts usually made principally with cheese, dried fruit and egg yolk, enclosed in a rich butter pastry ... but as this was a fast day feast, those served were probably very clever fake tarts, made with dried fruit, almond milk coloured yellow with saffron, flavoured with spices and damask rose water, and all enclosed in an oil-based pastry. **Vne sanz plus, could be translated as 'One without peer'. Catherine was said to be very attractive and Henry was apparently quite smitten by her. I just hope she liked the cetacean-rich meal given in her honour. ....... But that subtlety is far too subtle for me. I wonder what meaning it was intended to portray. Again, any ideas?